Dinner and a glass of fizz for two at Farmer, Butcher, Chef, overnight stay at the Goodwood Hotel with breakfast the following morning. Treat your loved one to dinner at Farmer, Butcher, Chef, an overnight stay in one of the Goodwood Hotel’s Signature Rooms, breakfast the following morning in the Goodwood Bar and Grill. What’s more, you will also receive a complimentary glass of fizz each over dinner, as well as full use of the Health Club facilities and access to The Kennels; Goodwood’s Member Clubhouse. 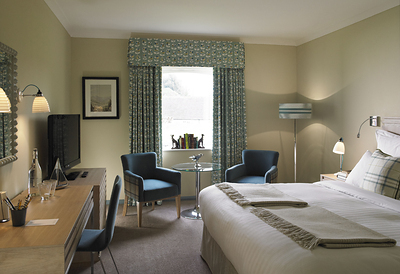 From £160 per room.Subject to availability. £160 single occupancy / £205 double occupancy. Available Sunday – Thursday. Not to be used in conjunction with any other offer. Treatments at The Waterbeach and round of golf at extra cost. Treatments at The Waterbeach must be booked at time of hotel booking to receive 10% discount.